Kircher's fascination with the lost culture and language of the ancient Egyptians was kindled shortly after his ordination into the priesthood. Upon entering his Tertianship at Speier in 1628, he encountered reproductions of hieroglyphs from the Sistine Obelisk in Horwart von Hohenburg's Thesaurus. Throughout his travels and during his tenure in Rome, he sought every opportunity to inspect artifacts and gather information relating to the Pharaonic eras, which he considered the root of all non-Christian culture and religious philosophy. In 1672 a Mssr. De Four excavated and transported a sarcophagus from Memphis to Lyons, from whence he wrote to Kircher asking him to translate the hieroglyphic inscriptions on the casket and on the mummy's wrappings. 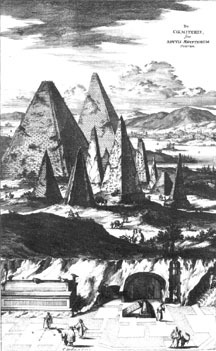 The result was Sphinx Mystagoga, the last of Kircher's six books on Egyptology. In this volume, Kircher discusses Egyptian burial practices, metempsychosis and reincarnation, and translates the Memphis inscriptions and a number of others according to the principles set out in what was perhaps Kircher's major work, Oedipus Aegyptiacus (3 vols. Rome, 1652-4). Although Kircher had earlier successfully unraveled the Coptic language, he refused to believe the hieroglyphs contained anything of less import than 'the highest mysteries of Divinity'. In spite of the resulting inaccuracies, Kircher's 'symbolic' position continued to hold some authority until Jean Francois Champollion's successful decipherment of the Rosetta Stone at the turn of the 19th century.